How to Fix Smoking Fireplace Problems? 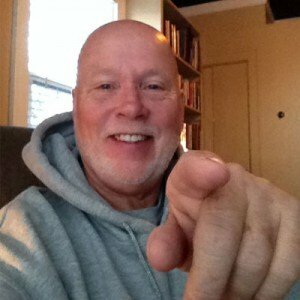 A recent question came into Ask the Chimney Sweep blog. Q: Our house is 20 years old and I have noticed the last 2 years or so and definitely this year that smoke fills our house. I thought it might be because of the chimney needing cleaning so we had a chimney sweeper come out and it didn’t help, it seems to have made it worse! Help!!! A: Your fireplace operating until 2 ago implies things have changed on the exterior or the interior of your home. Starting on the exterior of your home and then moving inside, here is my list that I would check! 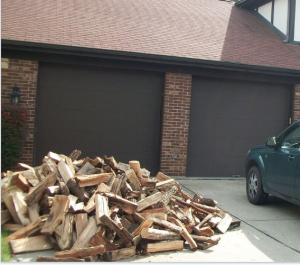 Once your wood has been delivered, keep your firewood close to the house. Best practice is to leave it covered six months to a year prior to use. Moisture content should be 15% to 25%. 1 – Check your wood supply because it must be dry of what is referred to a 15-25% moisture content. This can be confirmed with a moisture meter that can be purchased online. Just because you think the wood look seasoned doesn’t mean that it really is. 3 – Consider any construction changes, either on your part or the neighbors. Room additions over the years could possibly be affecting the draft of the fireplace. 4 – I believe every chimney should have a chimney cover as well as a spark arrestor. If the cap sits less than 6” off of the top of the flue it to may be a culprit. There are many good updrafts inducing caps on the market. I personally like the WindBeater with the Birdguard by HomeSavers. 5 – New roof, new exterior paint, vent and wind turbine can produce new air issues in your home. 6 – And now moving to the interior let’s talk about air balance within the interior of your home. This is where I find most solutions for my customers smoking problem. Newly blown or sprayed in an attic, insulation, new insulated windows, attic fans, bathroom fans, Jen Air ranges. I would go so far as to check the furnace filter if it is allowing enough air to pass throw it. It is interesting how many homes that we get into, where newly installed glass block windows in the basement seemed to initiate a smoking issue. Any of one or a combination of these items can alter the air balance just enough, to bring air down your fireplace chimney when it is in use. So, Christina, your mission to solving smoking fireplace problems is to find what has changed so that you can re-adjust it somehow to make your fireplace operational once again. 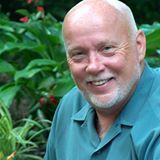 I would also suggest journaling each step that you make or adjust as well a documenting the outside weather conditions. Then noting the flame activity as well as signs of smoke might be beneficial. Installing the SmokeGuard reduces the size of the firebox and puts in proportion to the size of the chimney flue liner specifications. 2 – Consideration possibly investing in a really cool product called a SmokeGuard. This thing is such a simple idea and has solved a lot of smoky fireplace issues. Personally, I like the black colored model as it hides in the fireplace appearance. 3 – I would try playing around by cracking a window little bits at a time (1/2″-1?) and monitoring time required to stop the smoking or to stabilize the fire. If opening a window helps, possibly consider installing an outside fresh air source into the fireplace. 4 – (If) this smoking continues, you could temporally raise the chimney stack. 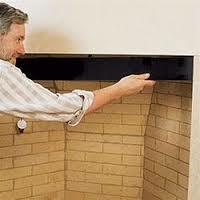 Do this by putting a metal pipe on the chimney flue top (this is only for brief testing conditions). If it solves your smoked odor problem then, I would get a couple of chimney contractor in.They can figure out the best alternatives to raising the chimney flue height. Is there a cathedral or really tall ceiling in that room or even a large staircase. The reason I throw that thought out is, smoke will always travel the path of least resistance. Smoke doesn’t care if it goes up a chimney flue. Or up to a staircase or just hangs out on the ceiling a stinks up a room. In conclusion, I hope this bouncing off of ideas helps. Please keep all of us all informed, as solving your fireplace smoking problems may just help one other reader. So, keep at it, and as I will bet you will outsmart your smoking fireplace problems! Clay, we live at 7000 feet with a snow pitch metal roof. When the wind blows from the south at right angles to the roof we get down drafts even with a swivel cap. The top of the Chimney was extended in the past with two lengths of ceramic flue liner. The top of the chimney extension is exactly 10 feet from the closest point of the roof but it does not extend above the peak. Our local sweep thinks the height is not the problem but thinks the 90 degree bend in the stove pipe that goes into the chimney slows the smoke and allows it ito cool letting cold air sink in. But since it’s only a problem with the wind from the south i wonder if the chimney height is the culprit. My concern is can we get the chimney too high and negatively effect its draft and i worry about the weight of an extra six feet of block on the chimneys existing base. Any thoughts would be appreciated. Thanks. You’re playing in another world at 7000 feet. Another factor is how airtight is the house. Smoke is a factor on its own, it can go up the stairwell, cathedral ceilings, and even take to a fan. Another factor is the 90-degree bend. Any of these are factors with what’s going on, as smoke’s got its own attitude. I would go with what your chimney contractor is saying because he lives in the mountains there with you so he knows what’s going on. I would start with the least expensive one first. I haven’t had enough experience with the swivel cap to speak about them, although I’ve seen a few clogged with creosote before that prevented it from spinning. I totally agree with you about being concerned about the weight of the chimney system. You may want to call a local mason contractor that can give you more information about the weight of the chimney system you’re dealing with.